No matter the season, you can always count on nature’s critters to come around and entertain you. This is the funny little Bewick wren. Small in stature, but loud in sound. This bird can sure belt out the birdsong. And then there’s the grasshoppers that you hope don’t hop right into your home when the door is open. Most every time I water lately, grasshoppers hop out of the plants to avoid getting wet. This is the funkiest red male cardinal I think I’ve ever seen. Does anyone know why he looks like this? He isn’t going to attract any female cardinals looking like that I don’t think. This critter is Charlie’s nemesis. He lives to see one so he can pitch a fit. 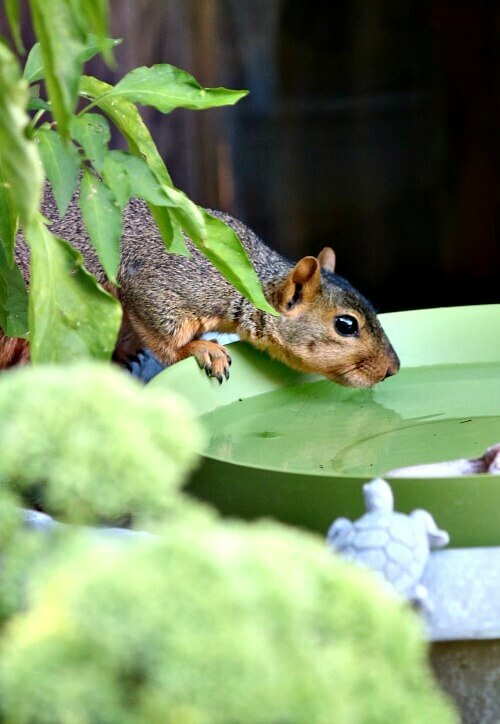 Squirrels are so fun to watch. They’re always full of mischief. I try to forget that they’re rodents. 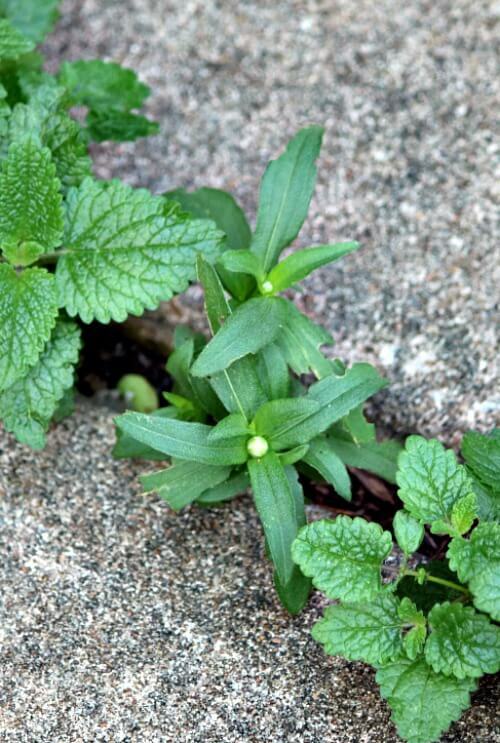 The big patch of purslane is at one end of this cement crack. And this is at the other end. Looks to me like lemon balm and zinnias. 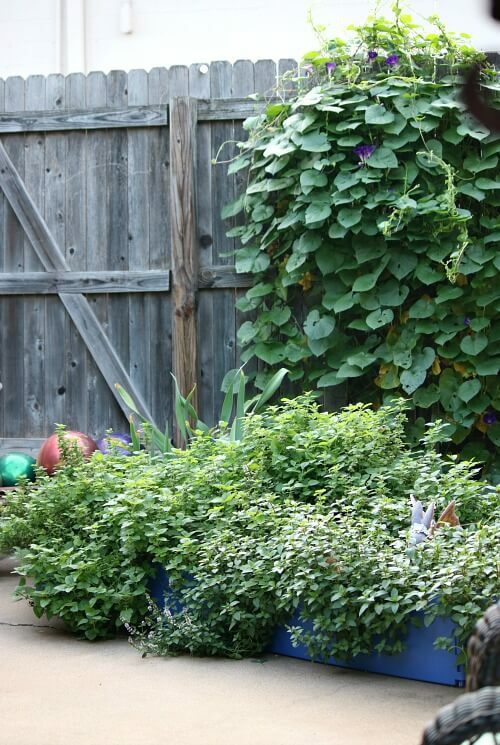 The morning glory vine, a volunteer that came up by the fence, is getting thick and lush with leaves. The blue raised bed is full of a bit of everything. Mint, iris (that I cannot seem to coax into blooming), and mounds of hostas that have been covered up. I’m sure there’s more plants in there, but I can’t see them at the moment. 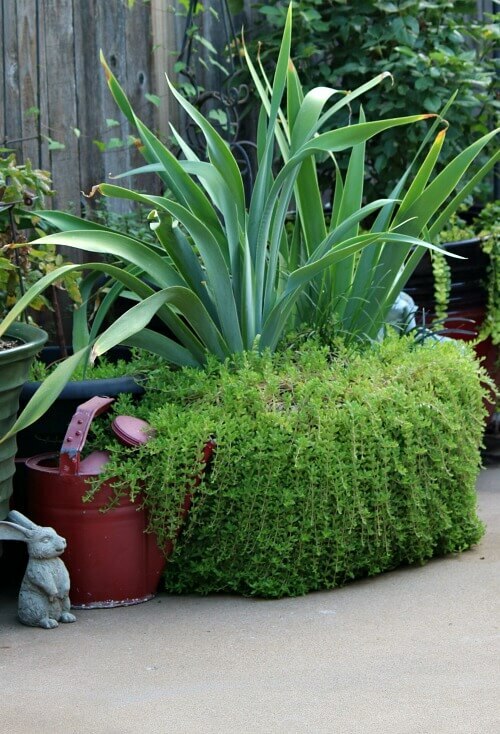 I planted the iris in this oval galvanized container. Sedum planted itself and is about to take over. Once sedum gets going, there’s no stopping it. Over here under the overhang of the tree are most of my container plants. As the weather grew hotter, I moved them down this way to give them some shade. You wouldn’t think they’d bloom under the overhang of branches, but they do get some sun and bloom just fine in this spot. If I hadn’t repotted the red hibiscus and moved it farther into the shade, it would be dead by now. Then right by the patio door are these plants. 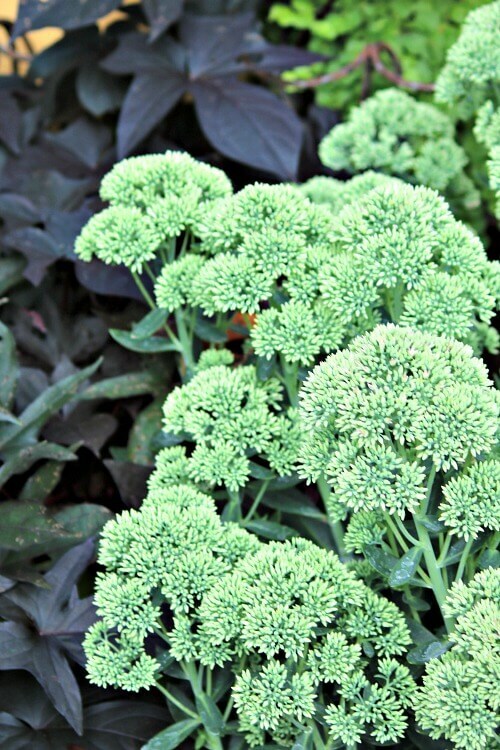 The sedum autumn joy will be turning a burnt orange soon, as the season moves a bit closer to autumn. Now you’ve seen virtually all of my patio garden. I don’t put plants next to the wall of my apartment because the wood is already pretty rotten there, and I don’t want my watering to make it worse. Summer will soon yield to another fall season. I started planting and tending to this patio space back in mid-April. I’ve watered and snipped and cared for it all through the summer. And unless something unforeseen happens, I will do the same next year and every year after that. That is just what a gardener does who loves digging in the earth, planting seeds and packing small plants into the soil. You have created a beautiful space! Could the cardinal be molting? He does look a bit shaggy! I’m not sure what that is. I’ll look it up. Your patio is so very lovely! Thank you for the grand tour. It is amazing how much wildlife you get to enjoy in the space you have. What a haven for you! The great thing is you don’t need much space to attract wildlife. Could be a balcony. I thought it might be a baby cardinal?? Your patio is gorgeous, you have made a beautiful spot to enjoy and relax in. Have a super Sunday! Maybe the poor cardinal has mites and has dug at his skin too much? I hope not. I have a tree out my window and I watch the birds and saw one who was going crazy with itching, and I felt so sorry for it. 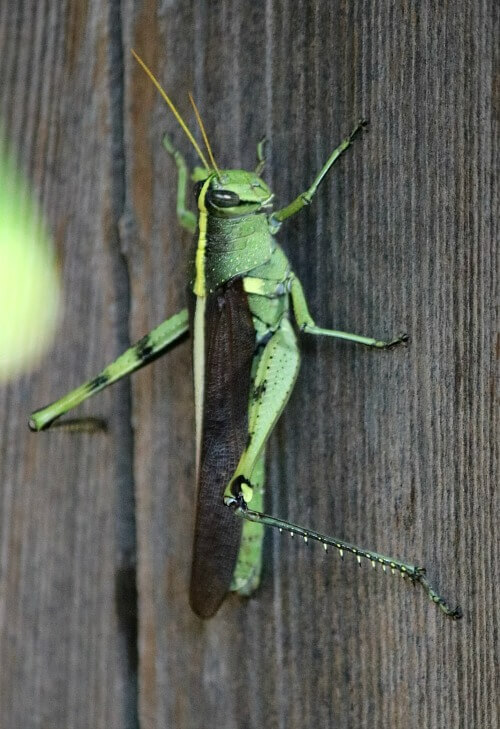 Aren’t grasshoppers wonderful to observe. I love their bodies, and you captured all the details in your photo, which I loved studying. I hope not, poor thing. Does this look like your grasshopper picture? It kind of does. But it jumped away pretty fast. The top part of the iris rhizome should be above the soil in order to bloom. The iris will never bloom if it is buried too deep and the rhizome is completely covered with soil. I had about 200 blooms this May that I started with just 10 rhizomes 35 years ago taken from my mother’s backyard that she planted in 1961. I have divided and they have multiplied all these years. You should be very proud of your lovely garden. I can only imagine what your former gardens must have looked like (probably-paradise). I have heard that. Next year I’ll dig them out a little. Or maybe in the fall. I THINK IT’S A YOUNG JUVENILE MALE, JUST COMING INTO ADULTHOOD. THEY LOSE THE “BABY ” FEATHERS SLOWLY REPLACED WITH THE BEAUTIFUL RED ADULT ONES. THEIR BEAKS AND FEET ALSO TURN FROM THE BLACKISH BROWN OF YOUTH TO THE ORANGE YOU SEE HERE. I SAY THIS BASED ON THE ONES I HAVE SEEN RECENTLY JUST OUTSIDE MY WINDOW, FEASTING ON THE SUNFLOWERS I PUT OUT FOR THEM. I was wondering if they were youngsters. I love your photos. Theyare absolutely beautiful. They make my day. Wishing my flower garden was half as gorgeous as yours. Hopefully, the cardinal is just molting. Here in Michigan, this usually occurs in late July and August. They lose their feathers and sometimes have bald heads after the stressful season of mating and taking care of their young. They will grow completely new feathers to protect themselves against the coming cold weather season. Sure hope he looks better after! 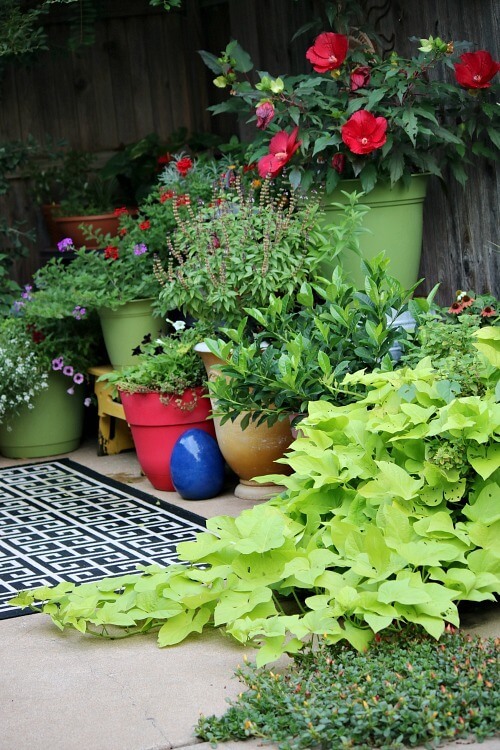 Your patio plants are wonderful! I too have just a patio but alas I don’t have your green thumb! But I keep trying! Please keep trying. It’s all trial and error. Good morning! You have created a magical wonderland in your garden! Everything is so beautiful, except the grasshopper. I do not like those things. I hope Charlie is feeling better. How is your eye? The right eye is fine. Kind of itchy today. Charlie is sleeping. Your garden is beautiful. I wish you could work on my yard. We have no rain in summer, or very little, and everything goes dormant or dies. I never know what to plant for these conditions and we have to watch our water usage. I make up for it with indoor plants that do fairly well. At least you have your indoor plants. We get quite a bit of rain. Such beautiful pics, Brenda. The wren one is perfect! Love the way his “feet” span the fence gap. 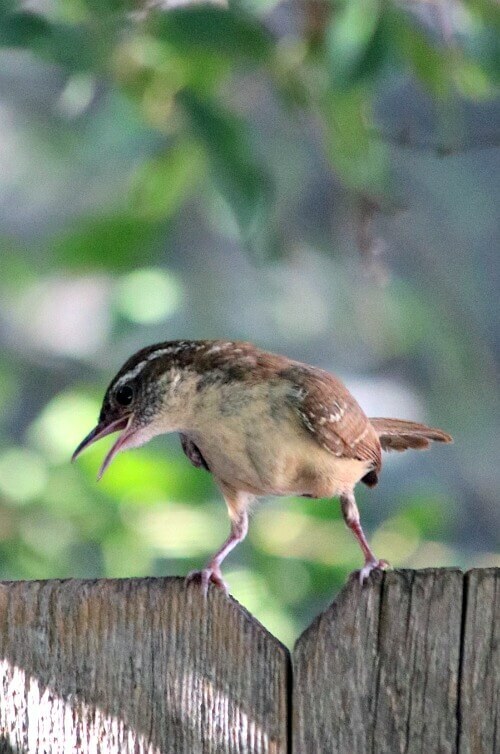 Those little wrens always seem to look awkward with their feet. They’re full of mischief. A few days ago, I saw a blue jay who looked quite ragged and like the thatch was missing from his head. I was really worried. Then another photographer blogger posted an almost identical photo of a blue jay in his yard. He commented the jay looked so ragged because he was molting. Relief. It was a similar look to your cardinal. Apparently the process goes by quickly. Oh good! I was afraid it was sick. Oh good! I was afraid it was sick. I just read that molting makes them irritable because it itches. I love your beautiful garden and all your photos ,I am very glad that Charlie is better . We must take care of our precious fur babies . I am flat of my back most days ,awaiting spinal surgery in September from a bad fall last year. Thank you for making my days better ! 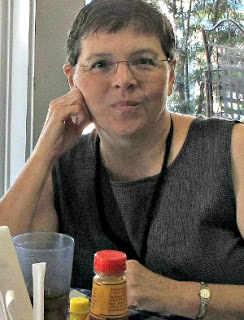 I am so glad I found your blog page ! I’m so sorry about your fall. I hope your spinal surgery is successful and you’re no longer in pain soon. 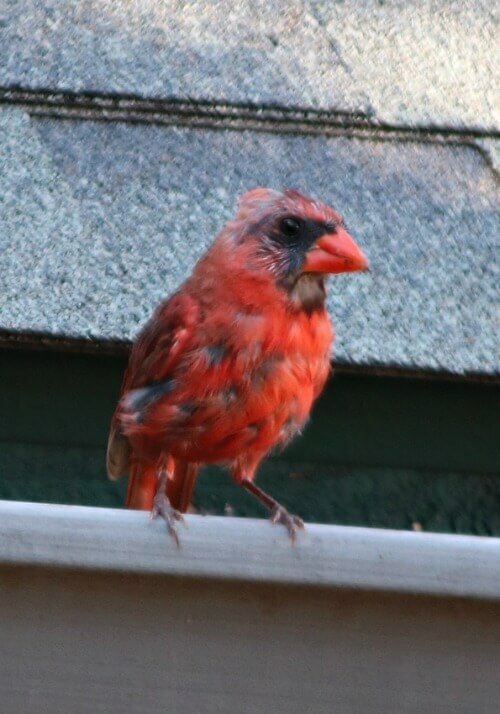 It looks like the cardinal may be a junior who is molting away his juvenile feathers and getting his full adult color. We’re on our 3rd or 4th egg hatching this season for the robins, and 2nd egg hatch for the cardinals. They make the most of the summer weather here! Wherever the birds went for about a month, they seem to be coming back now. Thank goodness! I missed them. 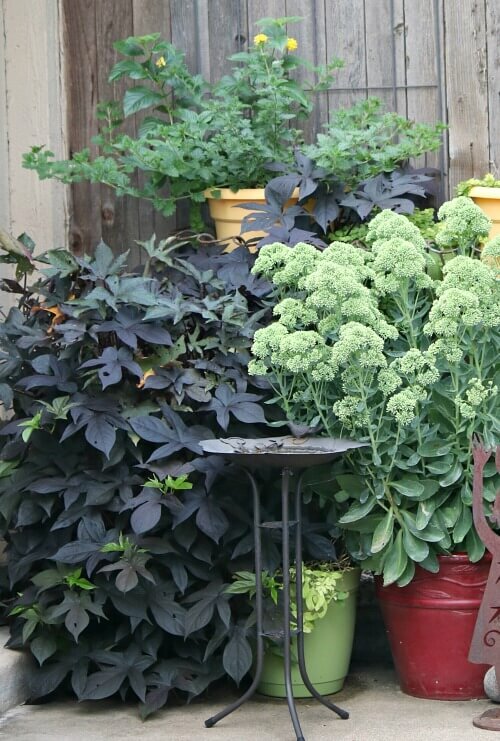 What a beautiful collection of flowers and plants, Brenda! How many plants do you think you have been nurturing this year? And how is the little jade tree doing? Give Charlie a pat and a yourself a hug. And enjoy those flowers before they are gone for the Winter! I know I have nurtured more plants this year than I did last year. I had to give two outdoor chairs away to make room for them! Jade is in the shade. Her leaves were getting burned in the bright sun. I too love those silly squirrels. So fun to watch! Such a beautiful garden, and such great photos of it and your “visitors”. I so love the visiting critters! That male cardinal is molting – look at Google images. You have a wonderful green thumb…I always thought your patio plants and house plants were some of the lushest, pretties plants I’ve ever seen. That looks like a juvenile cardinal, hasn’t got all his grown up amazing red feathers yet! Maybe there are some females out there in the same shape. I don’t want him to be lonely.